Summer’s not quite over yet (as evidenced by the 90+ degree September we’re currently having in Nashville), so I thought I’d pass this one along while there’s still some heat in the air. 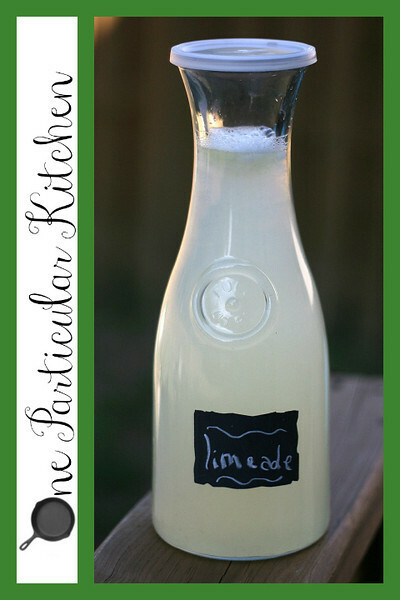 You can make this with lemon, lime, key lime or any combination thereof; today I had a bunch of limes so limeade it is. Serve over ice, ideally on a veranda. This may or may not be great with a splash of vodka. I haven’t heard either way. Ahem. Wow! That sounds really good and I love the cute bottle!! the bottle is really cool, where did you find those? I love limeaid, and I agree its amazing with vodka. Especially raspberry or cherry flavored vodka. Wish I had limes to make this! Thanks, y’all! I got the cute bottle at Pier One, although it’s been a couple years. I love it too! it is still close to 100 degrees(or over!) here in dallas! this sounds like a perfect way to beat the heat!